A first-timer's experience with Ingmar Bergman's Persona could hit them harder than they might expect, especially after its enigmatic, sensory-rattling opening: sparks generated by a projector's arc-light system, stretches of silent-era footage, and flashes of provocative innuendo-laced imagery quickly offset one's point of view. It's intentionally disorienting as a primer for what's to come, a distortion of the audience's perspective during those moments while they're trying to resolve who's the observer of the story manifesting before them. Are these clues, thematic suggestions, or merely red herrings leading into what's ultimately one of cinema's early iterations of a maze-like contraption of a film? The answer, if you want to call it that, lies in the experience itself, really, and its avant-garde intentions towards observation and interpretation. Marking a transition point in Bergman's career as his breathtaking composition and eerie existentialism further explores the psyches of two isolated women, Persona remains a mesmerizing abstract endeavor that tiptoes the line between the graspable and unknowable. Eventually, after several minutes of jarring visual devices with little outward rhyme or reason (aside from clear references to Bergman's previous works), the story proper begins with a young nurse, Alma (Bibi Andersson), accepting an assignment to help a celebrated actress, Elizabet Vogler (Liv Ullmann), overcome a state of being inexplicably stricken mute. Deeming the patient psychologically and physiologically fine, her doctor suggests that the pair withdraw to an isolated beach house for further treatment in a casual environment, with Alma more as a potential conversation companion instead of a medical professional. From there, Persona pivots on the details of Alma's stream of dialogue aimed at the actress, revealing more about her experiences -- her engagement, her previous sexual encounters, her ambition as an individual -- as the silent Elizabet absorbs and reacts to her chatter. Tension mounts as their time continues, with Alma herself eerily and reverently adopting some of Elizabet's traits. Note: Click each link under the images for larger versions. 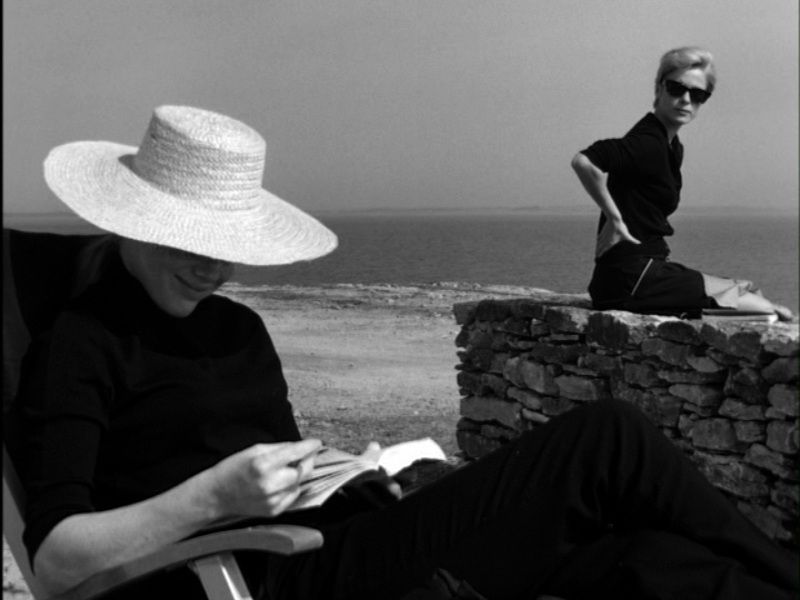 Filtered through the lens of Bergman's crucial collaboration with cinematographer Sven Nykvist, Persona frames the relationship between Alma and Elizabet in the director's signature stark visuals, from the sterile claustrophobia of the hospital to the airy, rocky expanses of the doctor's seaside house. The isolation and craggy landscape inform the film's expressive core, shaping the nurse's character as she bears her soul with no indication whether Elizabet will return the favor. When they're not taking walks along the Swedish coast, their closeness gets shrouded by eerie shadows within the free-flowing home, the intensity of their gazes and the creases forming in their facial expressions becoming important as Bergman's construction of their identities comes into focus. 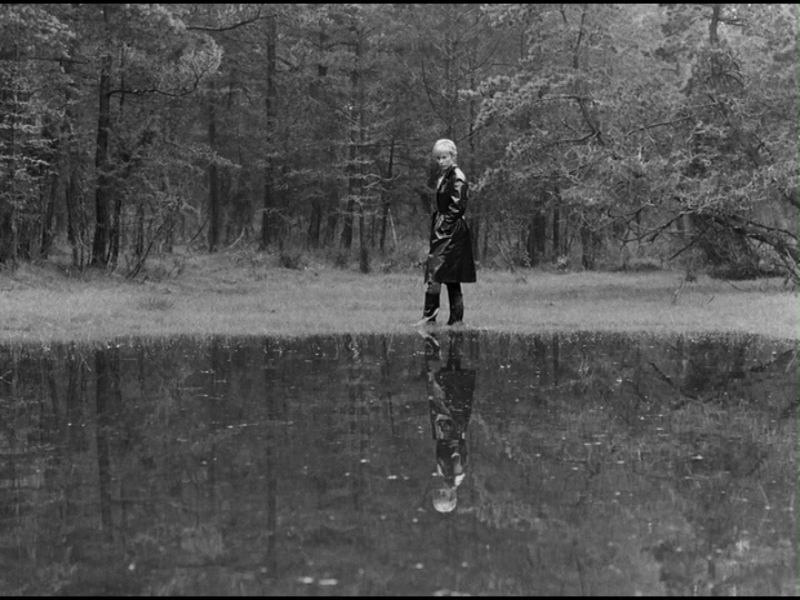 His concentration on imagery evolves into an emotionally-provocative exploration of mirror images and reflections, where some of the director's most profoundly lyrical shots -- a silhouette against the ripples of a pond; the overlap of bodies in an obscuring fog; the conscientious interruption of celluloid damage -- compliment the story's challenging grasp on identity. Bergman cleverly lures the audience into embracing the nurse's steady admissions and submissive admiration, freely divulging her secrets and trust; he also, on the other hand, urges those watching to observe how Elizabet reacts to Alma's common flaws and Personal idiosyncrasies, and how Alma herself responds to the lack of recompense. It's fascinating to behold: Alma's vocalized interpretations of Elizabet's purely physical reactions, often in the form of accusations, might differ from the audience's, the stunted actress' thought-processes rarely a certainty as their one-sided candor gradually turns toxic. Bibi Andersson's presence evolves into layered and intense complexity as Alma's jumbled personality comes to the surface, the fire in her eyes and body language developing as the film furthers as an exercise in human observation, of repressing and avoiding one's Personality because it makes their life easier. 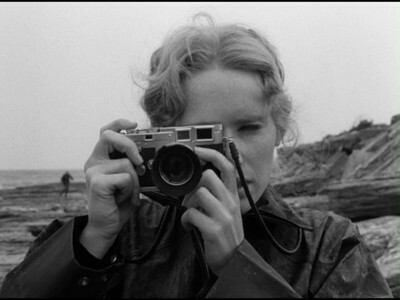 Liv Ullmann's eerie near-silent performance, herself expressive through eyes and bodily gestures, potently validates Bergman's ideas about the power-play involved in dependence, egotism, and unspoken attraction. 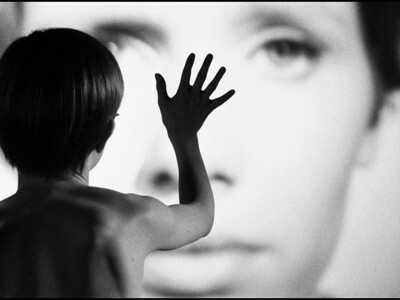 Persona's solemn examination of the human disposition takes a sharp, cerebral (and, some might say, anticipated) turn into Bergman's wheelhouse of surrealist and existential considerations later on, using what's known about the two women as a medium for interpretation about their true identities. The director doesn't hold any of his creative aspirations back as disquieting imagery and abstract plays with the medium -- two sides of a face lining up with one another; the sizzle of overworked film to convey volatility; the reemergence of bizarre images from the film's prologue -- spiral the film into an analytical playground, urging those witnessing the unspooling rapport between Alma and Elizabet to question the nuance lying underneath. 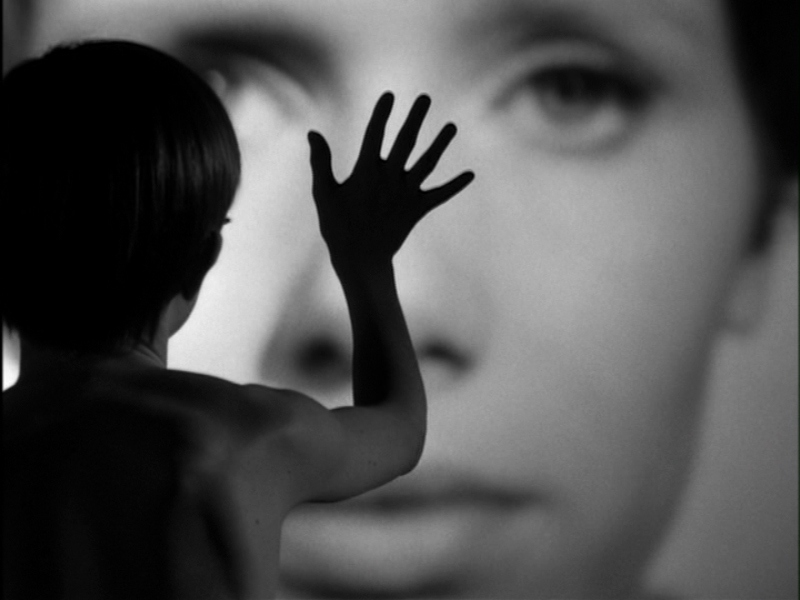 Like many of Bergman's films, however, Persona's challenges to the audience suffer little from pretense or futility: its clues and visual triggers, willfully contrived into being bizarre and intentionally provocative, form a cohesive mosaic that never lets the director's puzzling, cynical ambition out of its sight. It's playful, deviously so, but not without purpose. Deciphering a concrete "solution" to what unfolds in this Pandora's Box of cinema might, perhaps, be an act of futility once everything's packed back up and prepared to leave the audience with their viewpoints. 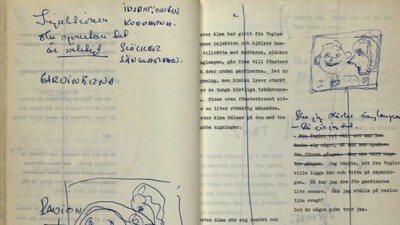 All one can really do is narrow down the assorted interpretations that Bergman puts before us: whether events through Alma's perspective manifest as dream sequences, flights of madness, or to be taken literally in the pair's psychologically turbulent time together, all of which work in context. And then there's Bergman's overarching ideas about perspective and cinema itself, seen through the rattle of film negatives and the fade of projector lights that bookend the film, maybe suggesting a correlation between the subjectivity of observing cinema and the subjectivity of comprehending someone's inherent persona. 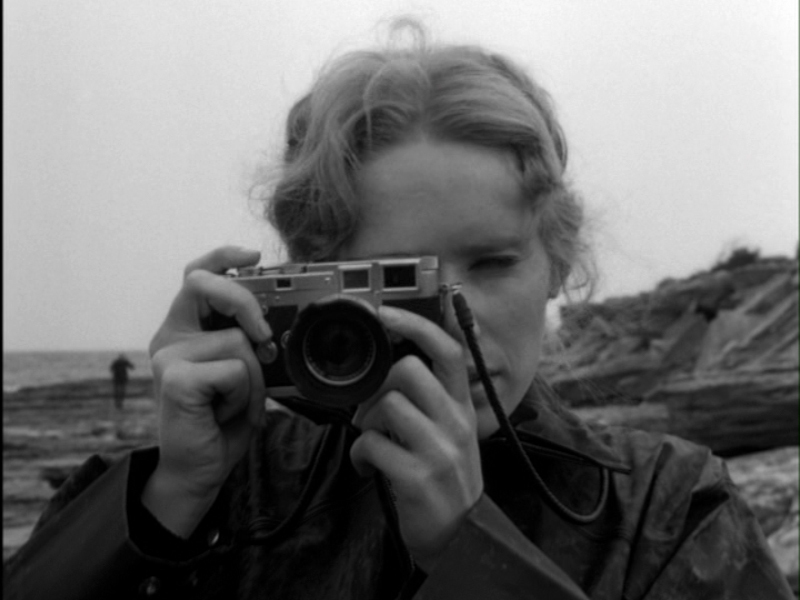 Bergman orchestrated a wealth of secrets under the surface in Persona, both figurative and literal concoctions that open up after further inspection (and introspection). The expertly-crafted psychological drama between Alma and Elizabet fascinates at first blush; the meaning built around their unstable rapport, which can evolve upon repeat viewings, is what makes it a masterwork. Persona emerges on Blu-ray from The Criterion Collection as spine #701 in a streamlined three-disc foldout package (one Blu-ray, two DVDs), sparse and minimalistic in its usage of black-and-white stills from the film. A reasonably sturdy slipcase cradles the simple half-fold package, necessary in order to keep the thick Booklet from slipping out since there isn't a flap or anything to keep it under control. Included in this thick 50+page booklet are a collection of still shots from the film itself and a few behind-the-scenes snaps, breaking up three essential batches of textual content: "The Persistence of Persona", an essay from Thomas Elsaesser; "Bergman on Persona", a lengthy interview with the auteur from the 1970 book Bergman on Bergman; and "Bibi Andersson on Bergman", another interview with the actress recorded in 1977 about the director himself. Criterion have also included their customary information about the film's transfer, as well as home-video production credits and a table of contents. Under an impeccable veil of stable film grain, there's a jaw-dropping caliber of depth, clarity, and source integrity present in this new HD transfer, which, in comparison to MGM's treatment, reveals more image information on each side and methodically elevates the inherent brightness in necessary scenes. Countless close-ups relish every ounce of detail in the actresses' skin surfaces and eye irises, while also expertly capturing fine textile elements -- Elizabet's straw hat, the grid pattern in Alma's nurse uniform, even the visible uniform folds in a fresh hospital sheet -- that add profound nuance to the image. Outdoor sequences also afford the disc several instances of displaying warmth and natural beauty, from rays of light absorbed in Elizabet's hat to the dark, jagged rocks surrounding the pair on the beach. The real showstopper with this Blu-ray comes in the disc's contrast levels, though: darker sequences display impeccable awareness of black levels, never crushing out details, while the film's signature sequence amid the gray, obscuring fog permeating Alma's bedroom capably balances the caliber of details intended to be seen and unseen. A hawk's eye might pick up on a few fuzzy frames and speckle or two in the print, might, but there's so much beauty and rock-solid digital veracity in Criterion's masterful presentation that they're swiftly ignored. The visuals are mesmerizing enough, in fact, that those watching might overlook the boost in audio that Persona has also received, mastered from the film's original magnetic track into a Swedish PCM track for the film's monaural sound design. While there's no way of completely purging the twang that comes from the film's era -- it's apparent in the rattle and sizzling of destroyed film elements and outdoor scenes with expansive atmosphere -- the overall clarity and the focus on versatile bass levels in supporting the dialogue give it a noticeable edge over its previous treatment. No noticeable hiss or distortions can heard anywhere in the track, while subtle sound effects like the rippling of fire, the sweeping of glass from a gravel path, and the distant blaring of foghorns enhance the eerie stillness ever-present in the film. Exceptionally-translated English subtitles accompany the track. The Criterion Collection get the supplements started with a Visual Essay from Bergman scholar Peter Cowie, entitled Persona's Prologue: A Poem in Images (20:15,16x9 HD). 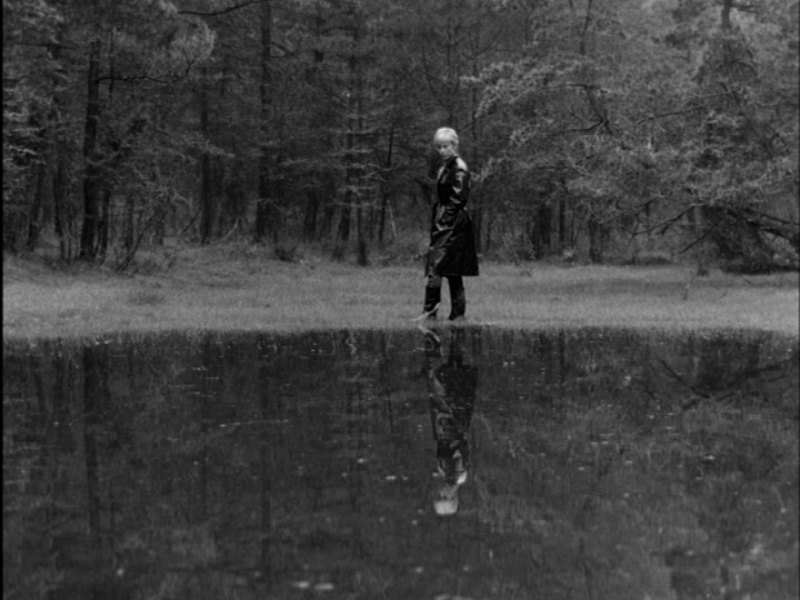 Within, Cowie dissects and elucidates the complex images from the film's first seven minutes, offering his knowledge about Bergman's struggle with the Swedish film council over Persona's title to the introduction's consistent references to the director's previous work. Pertinent clips from his earlier films and on-set footage add spice to the insightful mini-commentary. The disc also includes a lengthy stretch of On-Set Footage (18:05, 4x3 HD) filmed during the making of Persona, which is entirely silent outside of scholar Birgitta Steene's commentary about what we're seeing. Her knowledge pours through exceptionally well as she offers anecdotes about Bergman's Personal life and identifies lesser-known faces among the crowd, while also offering insights on the shooting locations themselves, how Bergman managed interviews, and whether shots appear to be rehearsals or the real deal. In the absence of a dedicated commentary, this pair of near twenty-minute chats with two experts on Bergman fills the void. From there, Criterion's slate of extras digs into a series of Interviews, several of which are unique archival discoveries. 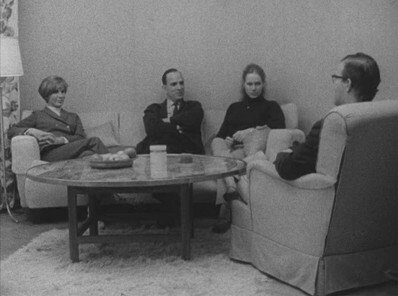 A fascinating Interview from '66 (19:32, 4x3 HD) features Ingmar Bergman, Bibi Andersson, and Liv Ullmann discussing the film with passion. Especially Bergman: he talks about accessible Western films and name-drops a James Bond flick, while also frankly and assertively discussing the unexplainable nature of the film, its nature as a catharsis for his "crisis of truth" after a quarter-year in the industry, and how artists are a "hodgepodge" of their experiences. A brief and general Interview with Bergman in '70 (8:11, 4x3 HD) features the director speaking in English as he vaguely chats about the nature of existence and his pessimistic viewpoint on the human condition. A pair of new interviews also make an appearance, including a terrific chat with Liv Ullmann (16:07, 16x9 HD) that annotates her history with Bergman and relishes the fairy-tale intro of their relationship, while also covering the actress' preparation for silence in comparison to Bibi's rampant dialogue. Filmmaker Paul Schrader (10:58, 16x9 HD) rounds out the interviews with his discussion about Persona as a significant second step in new-wave cinema and in Bergman's cinematic transition. As if the preceding content weren't enough, The Criterion Collection have also managed to squeeze in the feature-length documentary Liv & Ingmar (1:24:29, HD), an exploration of the longtime collaborators and romantic partners from the perspective of Liv Ullmann. While hearing the actress' point-of-view on their relationship in itself holds one attention, describing her experiences in meeting Bergman and existing in his world of isolation, the documentary itself feels overlong and sentimental. It becomes an exercise of enjoying the parts instead of the sum, including archival footage and glimpses at Bergman's Personal letters. And finally, the disc includes a Theatrical Trailer (2:43, 4x3 HD), which showcases exactly how far along the print for Persona has come along over the years. Criterion's package also comes with the two-DVD presentation of the film to fill outs its three-disc foldout package, including all supplements (Liv & Ingmar comes on its own disc). Ingmar Bergman's Persona challenges the audience's perception of identity and psychosis in ways that continue to influence the psychological-drama genre, doing so long before the likes of The Double Life of Veronique and Mulholland Drive. It's a beautiful, uniquely unsettling, and equivocal example of the craft that balances founded interpretations with just enough deeply-felt mystery to make one question what they're ultimately witnessing, while exploring the nuance of two women's empathy and hostility towards one another amid psychological quasi-treatment. 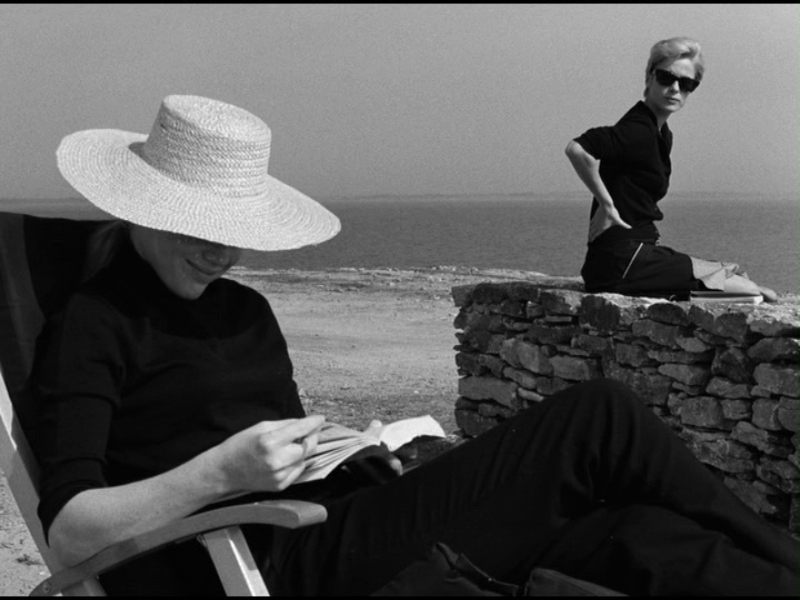 Bergman's ambition for this bleak exploratiion takes shape through the engrossing performances from Bibi Andersson and Liv Ullmann, only becoming more enriching and complex upon repeat viewings as their enigmatic connection leads audience towards different school of thought. This is a film that demands multiple viewings, and the director's craftsmanship ensures that each journey back to the Swedish beach house will offer something new. We've come to expect great things from Criterion's transfers, but the visual quality delivered in Persona's new restoration is really something that needs to be seen, not to mention the uptick in audio fidelity. Complete with archival interviews, on-set footage, a visual essay and a feature-length documentary on Liv Ullmann and Ingmar Bergman, this is certainly a release that fits squarely into DVDTalk's Collector Series.